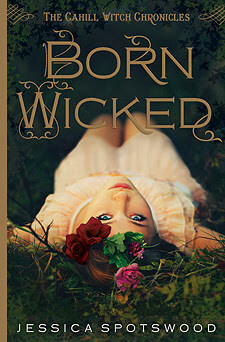 So, after going on the Breathless Tour, I picked up Jessica Spotswood's Born Wicked novel. Not only was it a pleasure to meet her(She's so sweet! ), but the book was an extraordinary read, that--well--left me breathless, in a dramatic sense. In a less dramatic sense, the book was amazeballs.The story? Everybody knows Cate Cahill and her sisters are eccentric. Too pretty, too reclusive, and far too educated for their own good. But the truth is even worse: they're witches. And if their secret is discovered by the priests of the Brotherhood, it would mean an asylum, a prison ship—or an early grave. Before her mother died, Cate promised to protect her sisters. But with only six months left to choose between marriage and the Sisterhood, she might not be able to keep her word...especially after she finds her mother's diary, uncovering a secret that could spell her family's destruction. Desperate to find alternatives to their fate, Cate starts scouring banned books and questioning rebellious new friends, all while juggling tea parties, shocking marriage proposals, and a forbidden romance with the completely unsuitable Finn Belastra. In my own opinion, I was rather intrigued with the idea Mrs. Spotswood had painted for us. Miss Cate Cahill is a girl with a whole bunch if weight on her shoulders. She made a promise to her mother that she's take care of her two other sisters, Maura and Tess. But, there's an entire cult of men that are hellbent on capturing girls like her. Witches. I rather liked how bossy Cate was. I could actually relate to her attitude towards not only herself, but others. She's drowning in all that she has to do and all of her worries. She's overwhelmed with it all, and she's not afraid to confide in her man-friend, Finn Belastra, her 'gardener'. We only actually ever witness him work the garden once or twice. And she's strong, too. She only ever swoons after some Steamy Times in the book. I appreciated her independence, even though the novel takes place in Victorian New England. Luckily, her independence isn't extremely independent to the point where it's annoying. And I absolutely adored Finn Belastra. He's not the usual run-of-the-mill bad boy with a broody mind type. He's got depth and he's not very predictable. At all. Half the things that Finn did I never would have thought he would do. And on top of all that, he's adorable. He's awkward and smart and serious and intelligent. It was a perfect balance for the uptight and bossy Cate. The story revolves around Cate's battles to stay sane and also keep her sisters safe. She'd do anything for them, even if it was half-dangerous, or scandalous. There's plenty of scandal in this story, well, scandal for a time period where women were considered fluffy airheads. The Brotherhood is always lurking around the edges, looking for reasons to perpatrate the women for witchery, and it really takes a number on our heroine. But she persists, and a number of things happen, and since I won't spoil it, I won't tell. Would I recommend reading this? Absolutely. How persistently? Pretty persistently. I loved what this story had to tell, and I can't wait for the next installment in the Cahill Witch Chronicles. I couldn't help by sympathize for Cate and root for her relationship with Finn. It was perfection at its best and a genre of YA that I wish would show up more. An amazingly great job for a debut author! Thank you, Jessica Spotswood! No, thank you! Oh, and spread the word about this blog, if you can; there will be plenty more reviews and all! *squeals* can't wait till the 2nd comes out!!! !